Every week we’re asking our summer interns to share some thoughts and responses to various experiences and readings. This week we asked them to share about their projects here at the Museum. To read more posts from JMM interns, past and present, click here. By now I’m three weeks in on my internship at The Jewish Museum of Maryland and the experience has been great. I have been able to work on various projects regarding the Lloyd Street Synagogue. 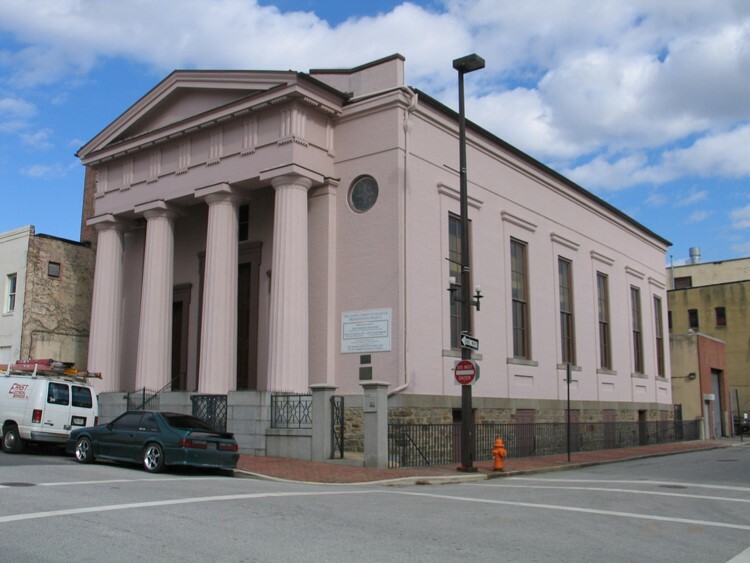 This incredible building constructed in 1845 is the first synagogue in Maryland. Even though the synagogue’s history and architecture are impressive, they are not the only things that make the building significant. It is the synagogue’s impact on the Baltimore Jewish community that makes the synagogue unique. Exterior of the Lloyd Street Synagogue Photo from the Jewish Museum of Maryland webpage. My first project regarding the Lloyd Street Synagogue was updating the archival inventory of the synagogue. During the duration of this project I went through hundreds of documents concerning the synagogue. This project allowed me to learn about previous research done regarding the synagogue and the various restorations the building has had throughout the years. What stroke me the most from this project was the hard work and dedication the staff from the Jewish Museum of Maryland have put throughout the years to have the synagogue recognized by the city as a historical building. Without this hard work and dedication Baltimore would not have the Lloyd Street Synagogue. Cuspidor from the Lloyd Street Synagogue exhibited on the “Voices of Lombard Street” exhibit. Photo by: Alexia M. Orengo Green. After finishing updating the archival inventory I began working with the archaeological artifacts excavated in the Lloyd Street Synagogue. This project has fascinated me! I’ve been cataloguing and describing each of the artifacts found. I’ve been able to encounter fabric, ceramics, and even iron nails! What I love the most about this project is getting to study each artifact and see how it fits on the Lloyd Street Synagogue narrative. Every time that I work with archaeological artifacts I try to imagine how they used to look at their period and who used them. I believe this helps putting the artifacts on perspective and helps me connect with the story. Both projects have been wonderful, and I can’t wait for what is next! One of the coolest parts about working in a museum is seeing an exhibit that was once just an idea and some words on a page come to life. Over the past few weeks I have been working on updating the Houdini exhibition script to make sure that the text and labels match the panels that have actually been installed in the exhibit. Usually the script should be finalized before text panels have been printed but I’m learning that sometimes you just have to go with the flow and tweak things along the way. Reviewing the script has been a great learning experience. 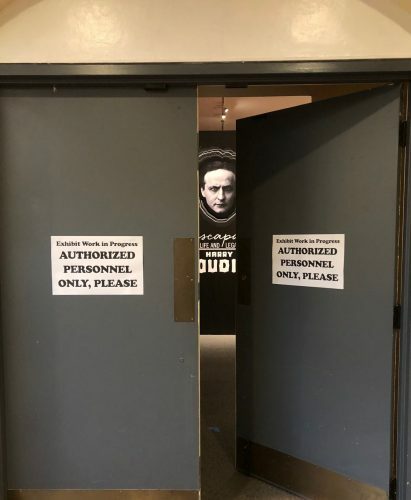 The Houdini exhibit has been a good example of the different ways an exhibit can be broken up into themes and still tell a consistent narrative. Reviewing the script has also given me an excuse to read every piece of text that has gone into this exhibit. Although I try, I’m never able to read every label and text panel at museum exhibits. Reviewing the script has made me appreciate how much effort and research has gone into this exhibit. Each label and text panel has been written to tell a fascinating story in a relatively small amount of space. Behind the scenes…exciting things are happening! After spending days reviewing the script, floorplans, and renderings I got the opportunity to watch the exhibit come to life. It has been so cool watching the exhibit come together piece by piece. 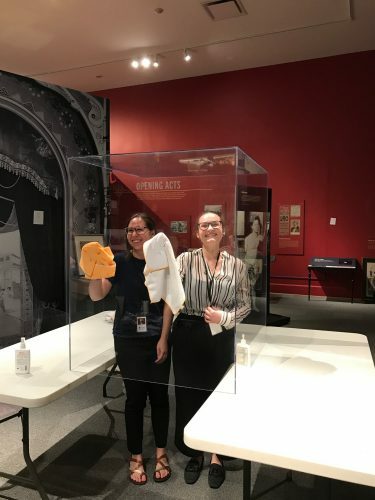 While I haven’t had any experience with exhibit installation, this week fellow intern Alexia and I got to help clean all the vitrines in the exhibit. This may not sound super exciting, but it was so cool to get to contribute to this exhibit in some small way. Alexia and I also got the opportunity to help arrange the handcuff display. 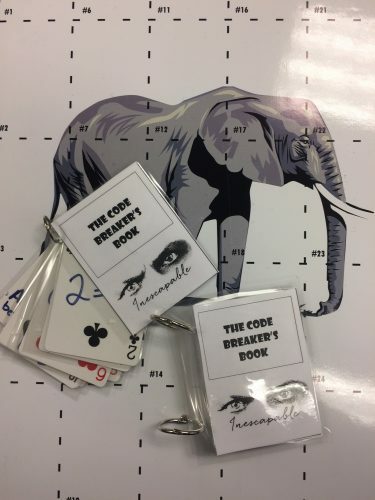 While we were concerned at first that the handcuffs and picks wouldn’t stand out enough against the black velvet fabric, the objects ended up showing up. I’ve learned that a small museum sometimes you just have to work with what you have and make the most of it. Alexia and I were only slightly concerned about being trapped in the vitrine. Luckily, we weren’t asked to perform any Houdini inspired escapes. For the last few weeks I have been helping prepare for the Houdini opening and the Jonestown Festival. For the Houdini opening we constructed houses of cards for table decorations and a card mobile that will decorate the lobby area. 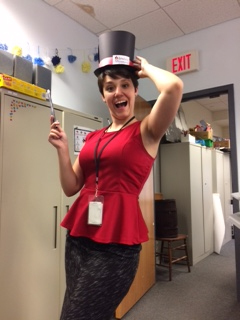 We will be making magicians hats and wands at the Jewish Museum of Maryland table at the Jonestown Festival. I spent my time last week prototyping the crafts. I was surprised how long it took me to figure out the exact measurements for the wands and the hats. I am excited to see the culmination of all of our hard work at both of the events. 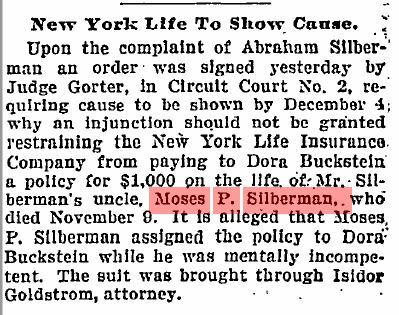 When I was not working on crafts and decorations for Houdini I was beginning researching for a pair of exhibits that will open next spring called Stitching History from the Holocaust and Fashion Statement. 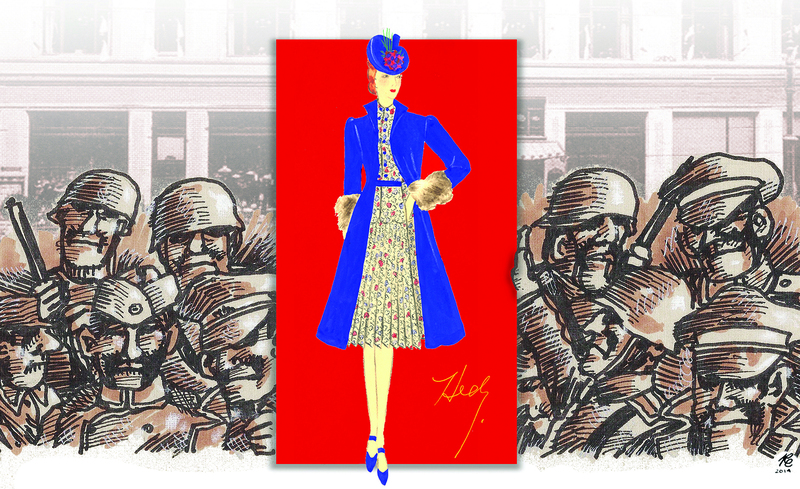 Stitching History is a traveling exhibit which was created at the Jewish Museum in Milwaukee. It tells the story of a woman who attempted to gain asylum into the United States during the Holocaust. She tried to prove her value with her fashion designs. She unfortunately was not granted access into the United States and perished in the Holocaust. Her family in Milwaukee kept the designs and donated them to the museum where they were brought to life and now travel around the country. 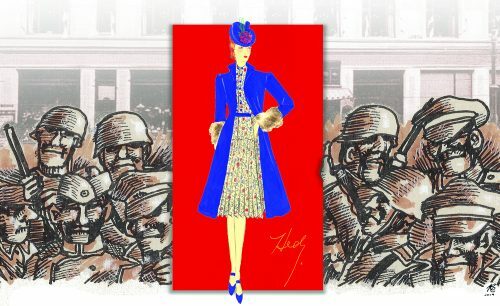 Fashion Statement will be an original exhibit created here at JMM which focuses on the Maryland connection to fashion and designs. I will continue to do research and work to develop programs for both of these exhibits. For the education department I have been working on creating bags that can be taken on tours of the synagogues to engage children. The activities in the bags will be based around the Synagogue Speaks book. I am working on developing an activity booklet that parents can pick up at the desk before their tours. I am also working on the education aspects of Stitching History and Fashion Statement which include creating lesson plans and activities for school groups. It is a very exciting time at the museum right now and I look forward to seeing what the rest of the summer holds. It’s been a busy, but extremely exciting start to my internship here at the Jewish Museum of Maryland; let me catch you up on what I’ve been working on! Over the past two and a half weeks, I have started two major, overarching projects that I will work on throughout the course of my internship. 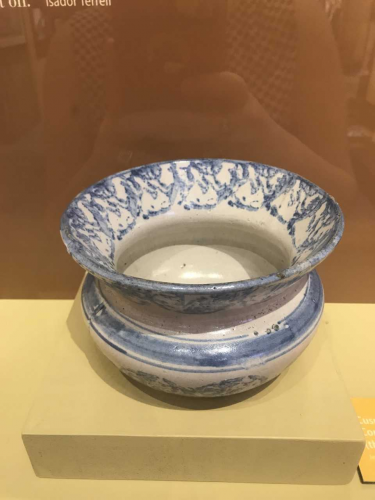 The first is planning programming for the Jewish Refugees and Shanghai exhibit from the Shanghai Jewish Museum that is set to open during the Lunar New Year of 2019. The exhibit explores the experiences of Jewish refugees fleeing Nazi persecution who settled in the port city of Shanghai, China. I feel well-equipped and especially excited for this task, as I studied Chinese in both high school and college. Last week, I spent a great deal of time familiarizing myself with the stories of the survivors of the Hongkou ghetto. From there, I have begun brainstorming programs. So far, I have found several potential speakers, a few hands-on events, and many activities for family day, and I am excited to continue looking for and planning programming that is educational, experimental, and fun! The other major project is creating bags of activities for parents and grandparents to do with their children in the Lloyd Street Synagogue; these activities will be a supplement/experiential element to the book The Synagogue Speaks. So far, I have been working on finding ways to introduce families to the different congregations that used the Lloyd Street Synagogue, as well as providing an opportunity for parents and grandparents to teach their children about Jewish customs and traditions. I hope to make the bags modular, so the experience will be new and fresh each time a family returns to the museum. I have had the pleasure of working with Ellie Smith on this project and am looking forward to continued collaboration! 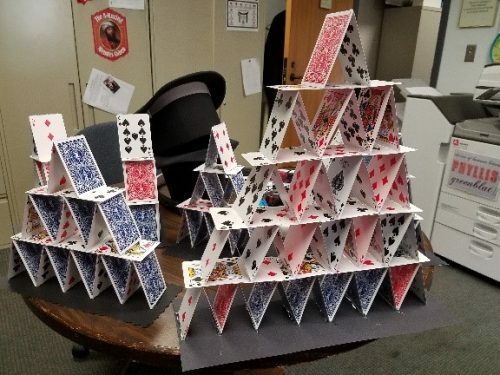 In addition to these projects, Ellie and I have both been hard at work on the final touches for both the Preview of Inescapable: The Life and Legacy of Harry Houdini (6/21) and the Magic of Jonestown Festival (6/24). I don’t want to give too much away and ruin the magic of surprise, but here is a sneak peek! I have also been prototyping and building the “code books” for the Vanishing Elephant education program, which will help the kids crack the magic code! I am super excited to see this program in action! It’s been an incredible two and a half weeks, and I am so proud to be part of this institution this summer! Daintily placed prom tickets and corsages. House addresses written neatly on envelopes. Valentines and birthday cards tucked between pages. 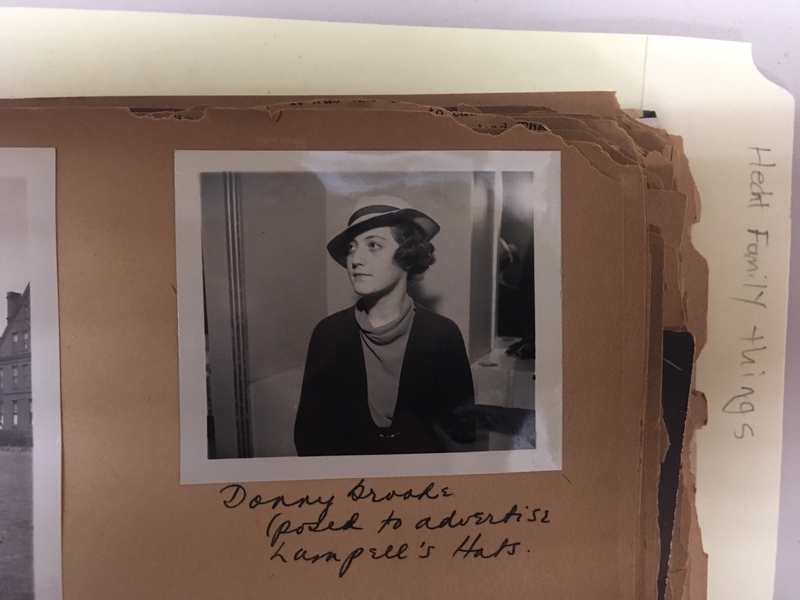 I’ve been milling through all the odds and ends found in scrapbooks these past weeks, either to write detailed documents of what I find, or to search for specific information. So far at the JMM, I’ve been learning how to process donated objects, mostly scrapbooks, and I’ve been learning how to correctly handle these objects. I’ve never looked through a stranger’s scrapbook before, much less written up a whole document on someone I don’t know based solely off of what they put in a scrapbook. I’ve also been able to see first hand how scrapbooks stay together and fall apart through the years. Gift from Eleanor Yuspa, JMM 2015.008.008. I’ve mostly been surprised by how tangible these different decades, these histories, feel to me now. Sure, I can read in a book about where someone lived in the 1930s, or read facts about who they married and when. But there’s something so much more fulfilling and engaging when you are looking for something else, flipping through pages filled with small objects and scraps of paper, and stumble upon someone’s address, only to realize that they lived on the same street as you – although they lived there 100 years ago. 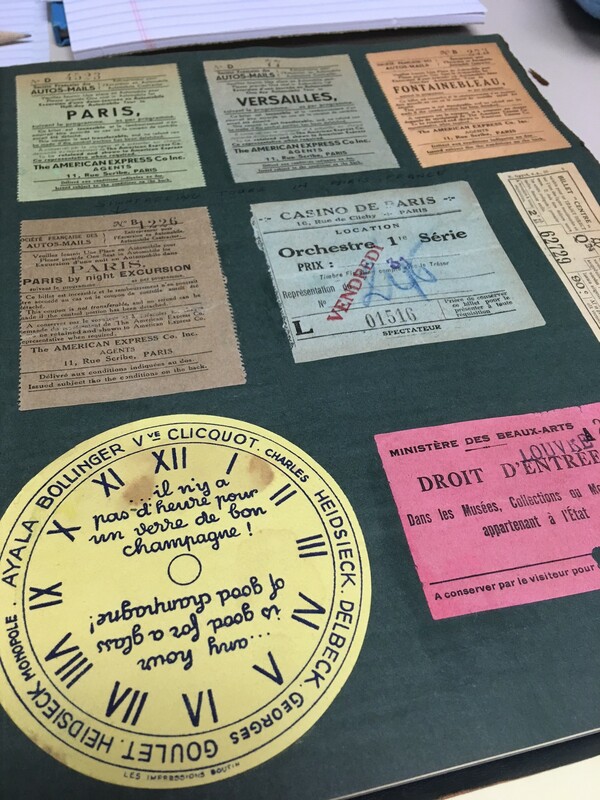 Tickets pasted into Isaac Hecht’s travel scrapbook from a trip to France. Gift from Eleanor Yuspa, JMM 2015.008.005. I’ve developed a deeper sense of how Baltimore as a city has changed, even just through the early to mid 1900s. 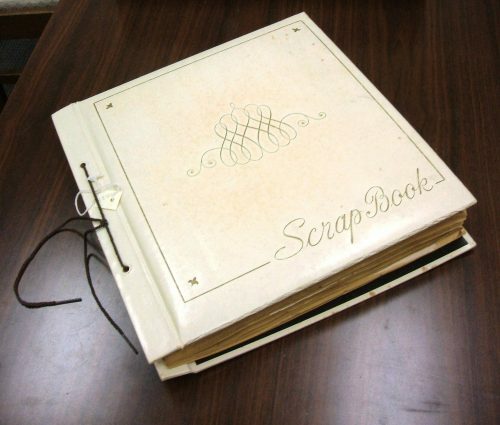 I also appreciate, more than I did before, scrapbooks and the people who make them. Picture inside Catherine Hecht’s scrapbook. Gift from Eleanor Yuspa, JMM 2015.008.004. 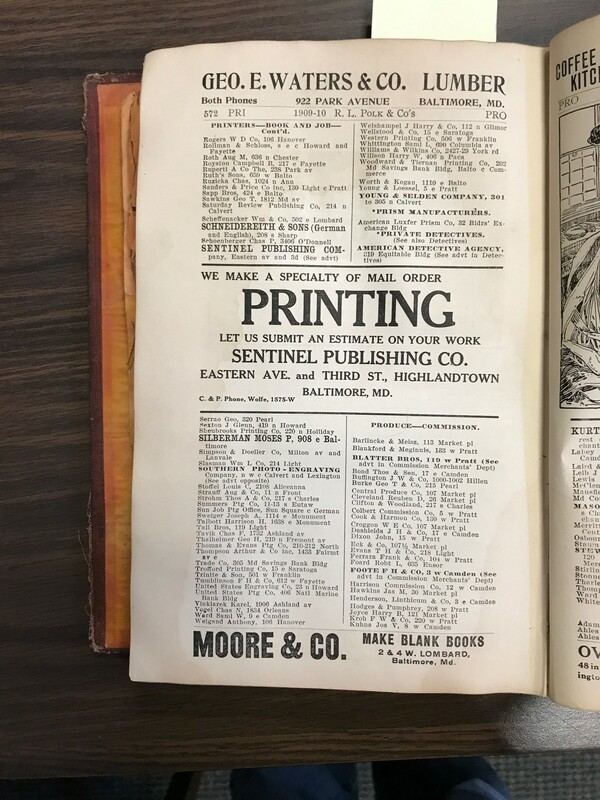 Although I’m only a few weeks into my internship, I’m really looking forward to handling more objects, more slips of paper and newspaper clippings, old advertisements and cartoons. I’m looking forward to the history, and the stories, they hold. 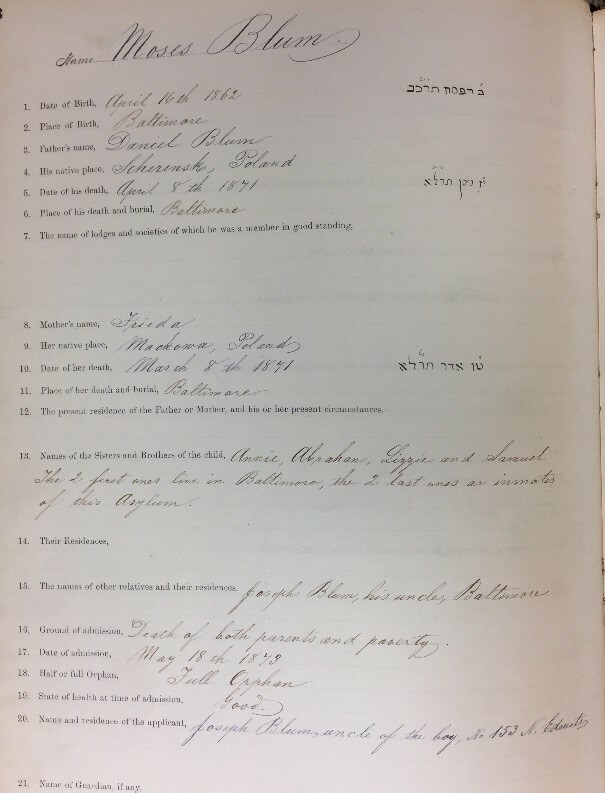 I also am hoping to learn more about Baltimore’s history and my own sense of connection to its Jewish roots. Blog post by JMM archivist Lorie Rombro. You can read more posts by Lorie here. 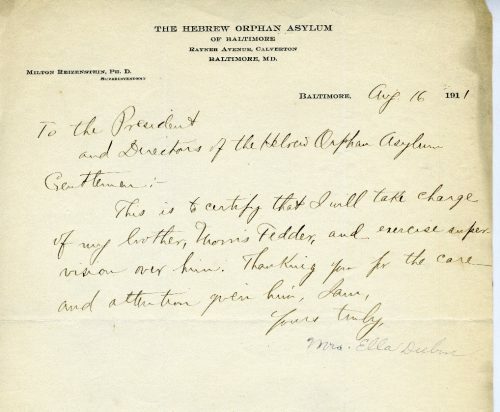 A few weeks ago, I received an information request about the Hebrew Orphan Asylum. 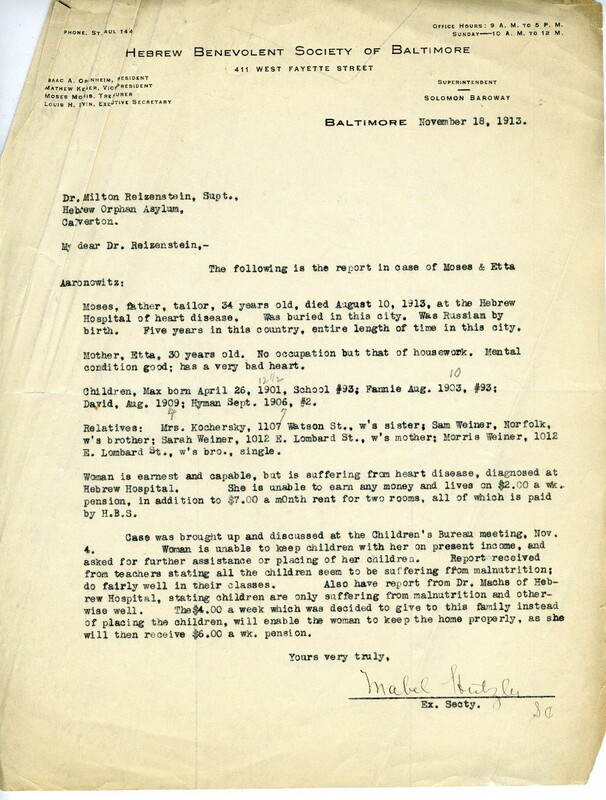 The person wanted to know if we could find information on if her grandmother and any of her siblings that had been placed in the Hebrew Orphan Asylum and why. 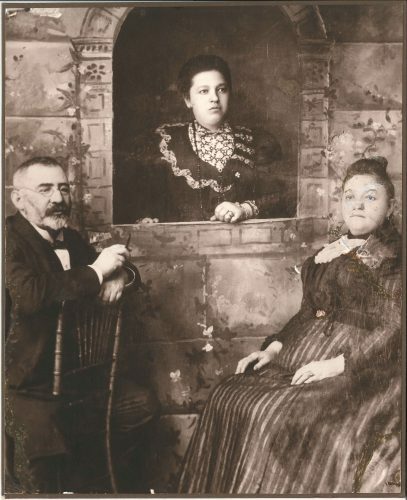 She said that family lore said they had been there, but they had no proof of this. This began another interesting journey through the collections. 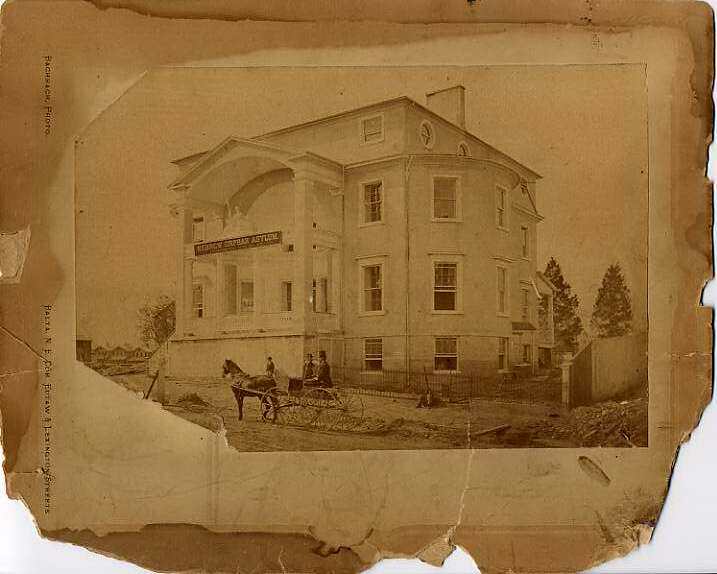 The Hebrew Orphan Asylum which was established in 1873 by the Hebrew Benevolent Society, was located on the outskirts of the city (at the time) in Calverton Heights. 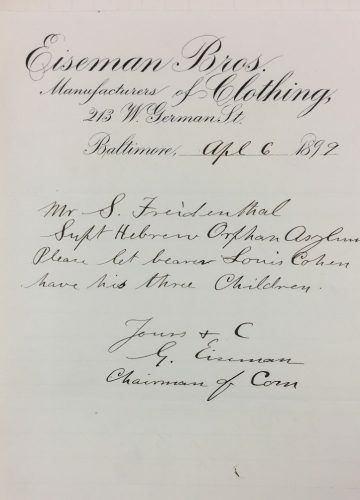 It would stay at the same location until 1923 when the Hebrew Orphan Society and the Hebrew Children’s Sheltering and Protective Society, which merged in 1921, moved out to what is now Levindale on the recommendation of the newly formed Associated Jewish Charities. With in a few years the orphanage was closed with the children entering the fostering system and the residents of the Hebrew Home for the Aging moving in. 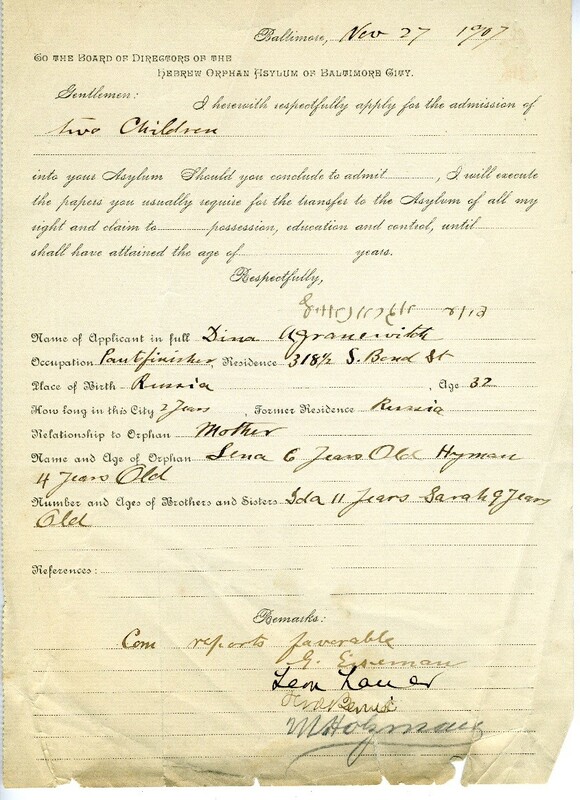 Because the person requesting information had done her research prior to contacting us I knew that sometime between the 1900 and 1910 her grandmother would have been in the orphanage. 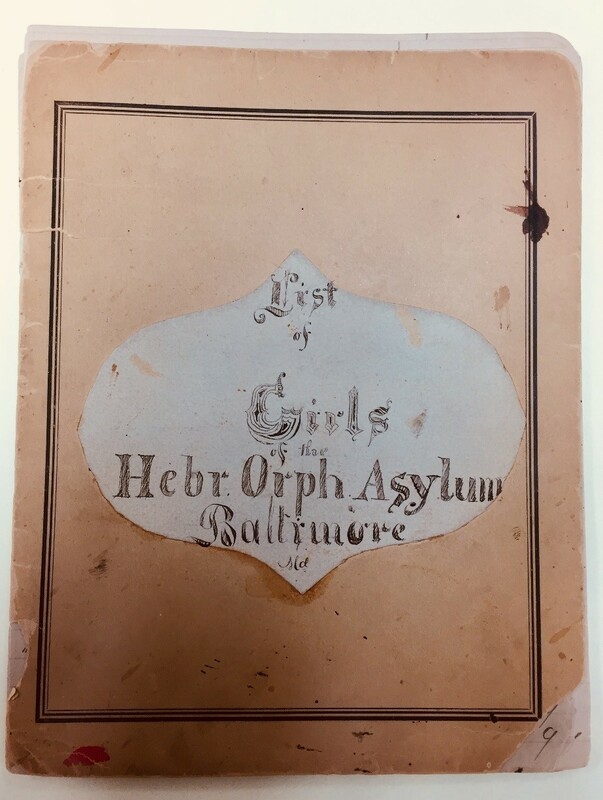 I began by looking at what we have in our collection, and identified a small book that listed all the girls and boys in the Hebrew Orphan Asylum. I was excited when I found her grandmothers name with the date of arrival and discharge next to her name. This book has a list of all the children age when they arrived and most have a discharge date as well. 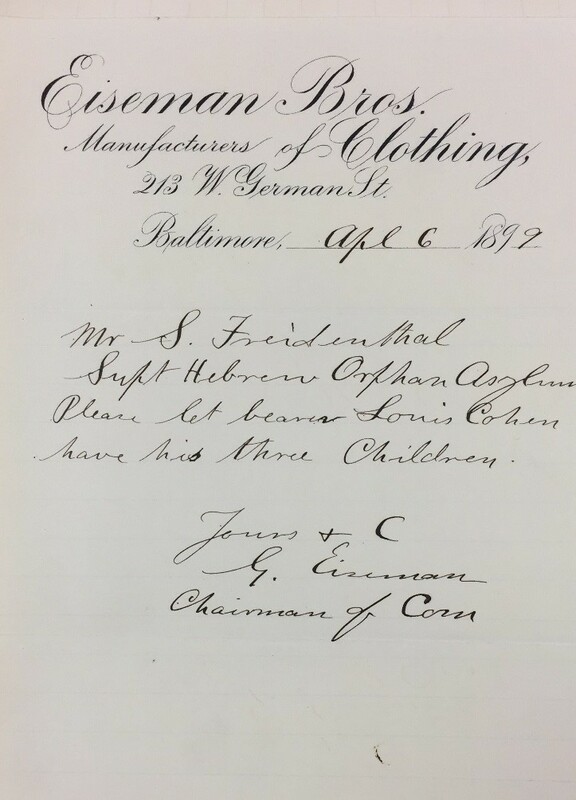 I was not expecting what I found next, two large books in good condition that contained the admissions records for the children from 1873-1896 & 1896-1917. Each book had an entry for each child providing information on the father, mother, siblings, reason for being placed, general health and additional information on family and behavior. The amount of information on each child varies but it allows for a picture of the child to begin. What was interesting is like most orphanages of the time the majority of orphans are “half” orphans, with either a mother or father placing them in orphanage for lack of funds or the ability to care for the child. Glued and placed in between the pages of the book where additional documents which added to the record. Including court documents, medical records and most important letters of discharge. It was amazing to see where the children went, often home to a parent, taken in by an older sibling when they were able to care for them, a relative or on to a boarding house to stay at because they had a job. One of the earliest records in the book on Moses Blum, one of the only full orphans in the records. I was able to locate the record for this women’s grandmother and her great uncle, why they where placed and that two years later their mother came back for both children. The location of the home they where being discharged to and any notes on behavior during their stay. Like many children that had a living parent there where reports of them running away from the orphanage to their parent. One book was able to put to rest a families questions on their history and gave documented proof that the stories where true. Most children under reason for admission was listed as insufficiency of means, poverty or like the above picture an ill parent. 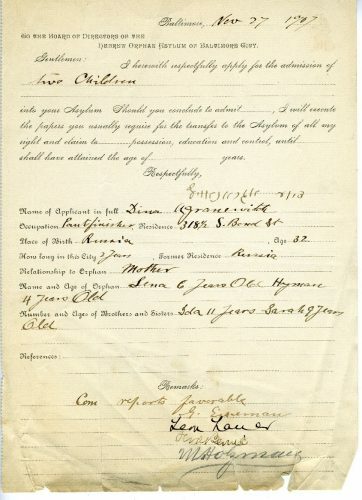 Court record for the admission of two of her children Lena, age 6, and Hyman, age 4 into the Hebrew Orphan Asylum. 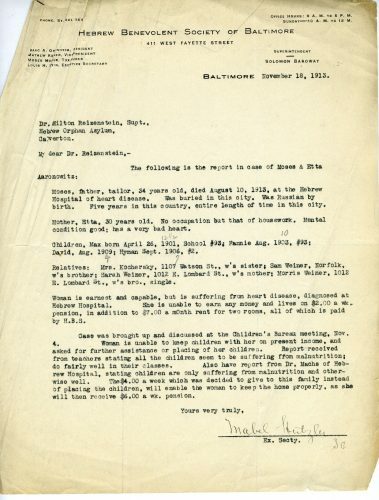 This request was accepted and Morris Fedder was given to the care of his sister. 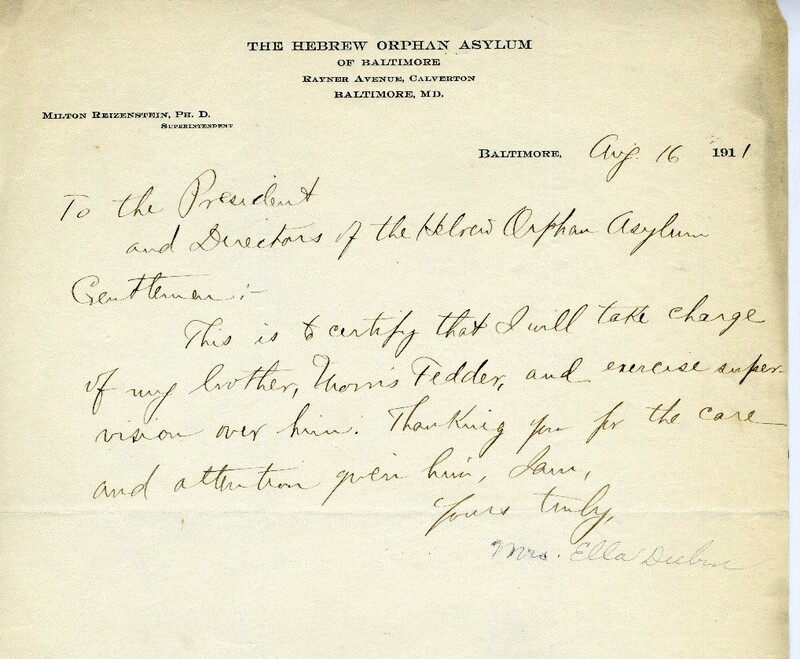 A request to release Louis Cohen’s children into his care. 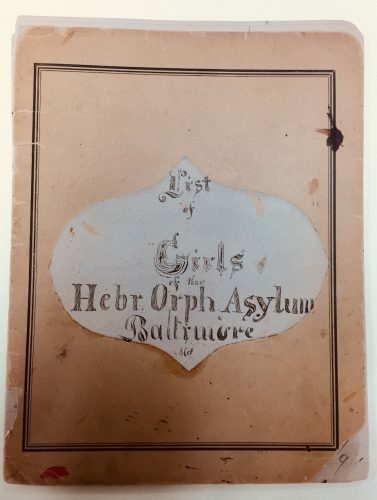 Not all children were placed in the Hebrew Orphan Asylum; often the Hebrew Benevolent Society of Baltimore would give additional funds to the family, mostly widowed women, so they could keep their children with them at home.